In this painting, the ship on the left is Columbus's boat people and the ship to the right is Haitian boat people both coming to America traveling over the same shark-infested waters. The work shows one arrival that America feels was acceptable and another that is questionable. On the left, one see symbols of civilization, a dollar sign, the torch of liberty and a reversed number one- the reversal it is a question whether the boats are arriving for freedom or money. 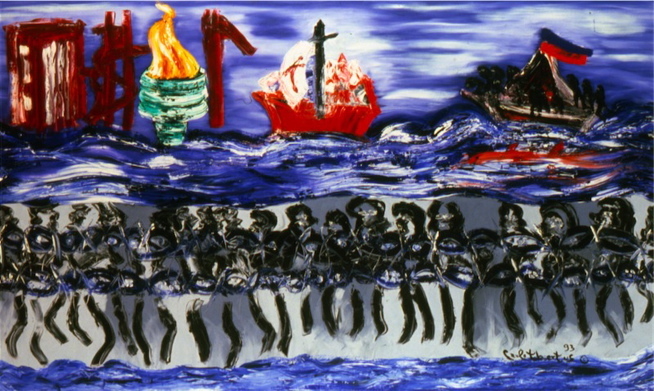 The bottom half of this painting represents the Haitians who were turned away and sent to Guantanamo Bay, Cuba. Remember, we all were once boat people.